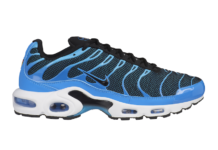 Nike is gearing up for the warmer months ahead with a few upcoming vibrant color options of the Air Max Plus silhouette. This women’s iteration comes dressed in sherbet hues. It features a gradient upper in a mix of Orange, Pink, and Blue tones with White plastic overlays and matching mudguard, toe cap, and midsole. The same vibrant colors are used on the midfoot shank, while having Black hints on the lace loops, tongues, Swoosh and rubber outsole. Check out the additional photos below, and look for this women’s Air Max Plus to release very soon at select retailers such as Foot Locker.